Mr Au Yeung at Waichow, who was he ?? A/B Stoker George [Bones] Arnold MTB 07, Mr Au Yeung, & L/Stoker Charlie Evans arriving in Kukong. The padded jackets were obtained by Colonel Owen-Hughes at Lung Chun. 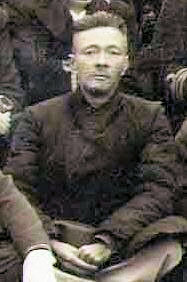 Owen-Hughes was the British Liaison officer to the 7th Chinese army. The party later swapped the jackets with an incoming detachment of British Marines.